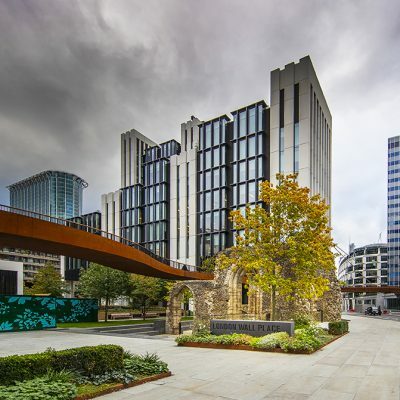 Sitting within the Roman relics of the city’s original wall, with remnants of the medieval church St Alphages, is an acre of public realm with the curved, winding, elevated walkways that link the two buildings at London Wall Place. The two office blocks total a space of 500,000 square feet for some 5,000 employees. Number 1 London Wall Place stands at 12 stories high and is the new London home for Schroders offices. 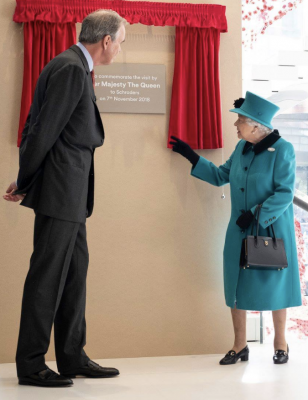 The Queen opened Schroders new premises on 7th November 2018. On completion of a tour of the building the Queen told traders she was impressed with the view from the 10th floor and joked it would distract the staff. Europlanters have been privileged to work on 1 London Wall Place and its 35,000 sq ft of landscaping, including nine terraces over seven floors. This includes two wildflower green roofs, one 427 sq m and another 120 sq m. The project required over 400 extra large planters to create various shaped planting beds and 161 hidden storage benches on several levels. The planters were fitted with lighting to add ambience in the summer evenings and were sprayed in RAL 7048 (metallic finish) to compliment the building. The architects designed the benches having been inspired by stacks of wood in a timber yard. These benches which were clad in Iroko had sockets fitted inside for charging laptops and phones. Her Majesty unveiled a plaque to open the new headquarters and the staff gave three cheers.